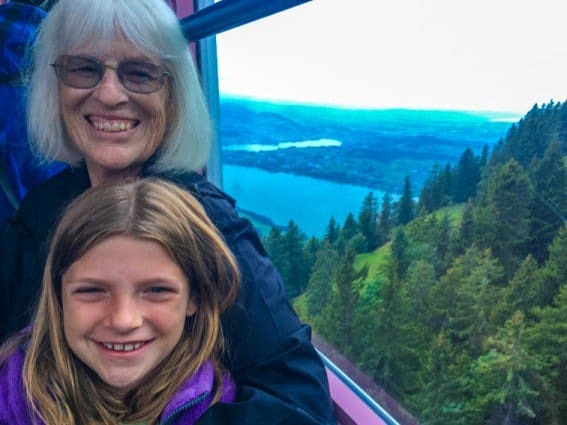 Upon returning home from a full month traveling through nine European countries with my 7 and 8-year-old children, a friend asked where they should travel in Europe next summer with their young granddaughters. 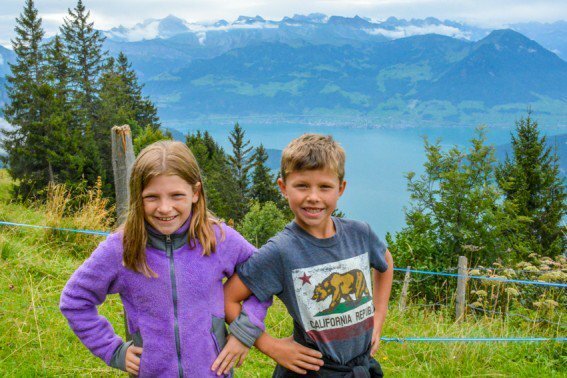 Without pause, I answered, “Switzerland!” adding immediately, “If you have the budget for it.” Here’s a Switzerland vacation itinerary for families visiting Switzerland with kids and planning to use the Swiss Travel Pass to travel on Switzerland’s trains. Food and lodging expenses in Switzerland are high. 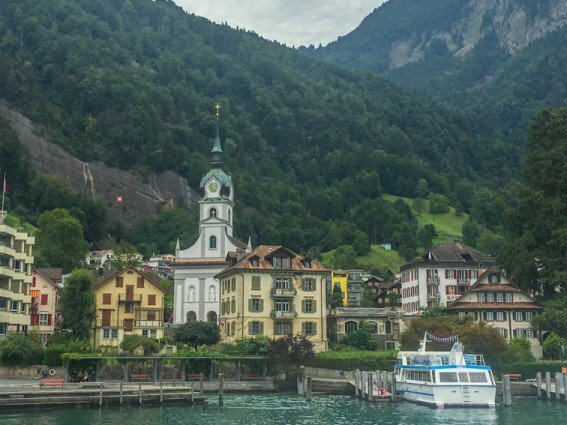 If you’re looking to make a Switzerland vacation with more affordable for your family, packing lunches is a good way to save money. Also, finding simple, well-located budget accommodations that include a hearty breakfast is helpful. 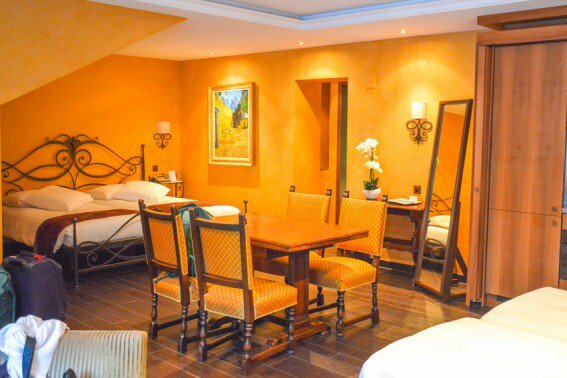 Affordable food and lodging will maximize how far your dollar or franc, in this case, will go. The other big expense that you’ll have on a Switzerland vacation is transportation. My family used an 8 day Swiss Travel Pass. We traveled up Switzerland’s mountains and across its lakes to all sorts of kid-friendly alpine adventures. We found our Swiss Travel Pass easy to use on Switzerland’s trains. It greatly simplified our Switzerland train travel because we did not need to purchase additional tickets in most cases. We used our Swiss Travel Pass for city transportation like buses, boat travel on Lake Lucerne, Switzerland train travel, select mountain railways like those on Mount Rigi, and even the Olympic Museum in Lausanne. Nearly every mountain railway, cable car, or funicular offered either a 50% or 25% discount. 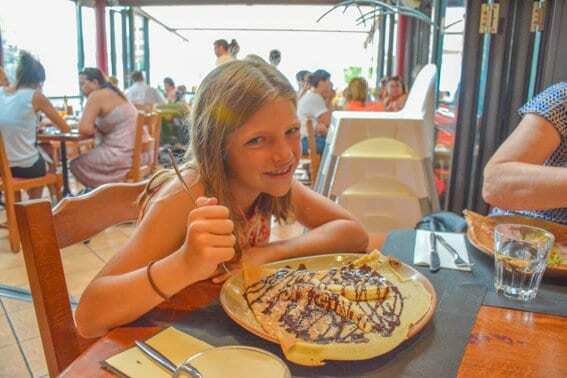 Virtually every expense that we had in Switzerland with kids, aside from food, lodging, and summer toboggan runs, was discounted in some way with the Swiss Travel Pass. While I would love to plan a road trip itinerary to Switzerland someday, I sincerely believe that using the trains, buses, and boats across the country is cheaper. It’s likely the best deal to be found on a Switzerland vacation with kids. After a short 25-minute train ride out of the city (STP) we arrived at the Rivera-Bironico train station. From the train station, we walked about ten minutes to a cable car station. The cable way is discounted 50% for holders of the Swiss Travel Pass. Monte Tamaro overlooks the valleys below. On a clear day, the city of Bellinzona is clearly visible in the distance. There are mountain peaks all around framing the landscape — though these peaks aren’t as rugged as the ones in the interior of Switzerland. There’s no glaciers or snow to be seen in August on these mountains. A visit to this mountaintop adventure park can last anywhere from a couple of hours to a full day. 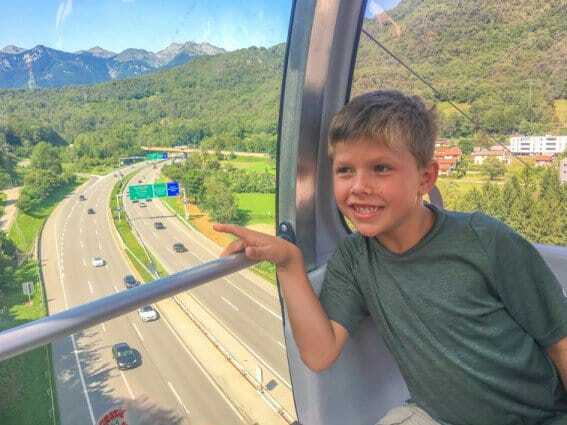 The attraction offers lots of add-ons, like a zip line and aerial adventure park, for families that want to make a full day of it on their Switzerland vacation. Families visiting Monte Tamaro should wear their hiking boots. The trails leading up from the playground and restaurant provide a much nicer view of the Alps to the north and west. Like anywhere in Switzerland, you could easily spend a full day hiking here being rewarded with new alpine views around every turn. 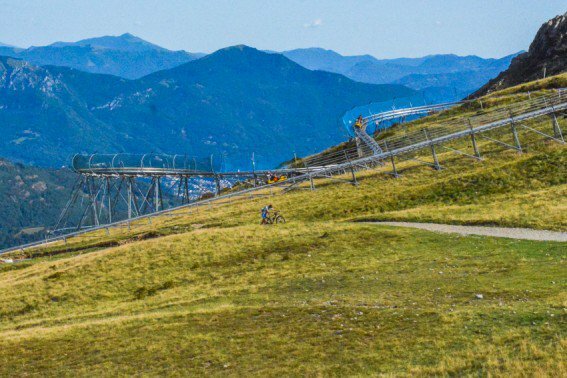 My children and I agree that Monte Tamaro has one of the best mountain coasters in the Alps. Of the five or so mountain toboggan runs and coasters that we experienced, this one was our favorite on our Switzerland vacation. Rather than sliding on metal, this coaster is on rails. Each curve appears to have the illusion of taking the riders over the side of a cliff. Finally, there is an awesome playground up at the top of Mount Tamaro. The long slide was a bit slow for my children’s taste. 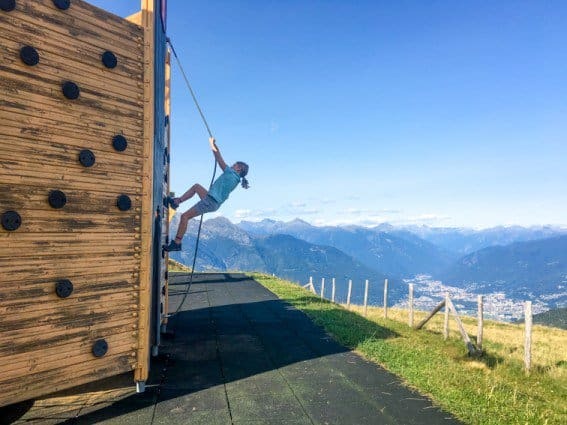 However, the climbing walls and playground structures had some of the best views of our entire trip in Switzerland with kids. Upon returning to Lugano, we strolled along the waterfront while eating gelato. Yes, Lugano is as beautiful as all the pictures that you’ve seen. Lugano is pure luxury from the views to the stores to the prices. We splurged a bit and stayed one night in the family suite at International au Lac Historic Lakeside Hotel. As lovely as Lugano is, once we saw our suite out in the garden by the pool, we didn’t leave the hotel again until morning. The family suite is one spacious room with two large beds, but it’s the courtyard and gardens outside that really impressed us. There were kiddie trikes in the courtyard and my children rode round and round. Later we went to the pool directly above our room in the middle of the terraced garden; it was cool, but we swam happily until the sun set fully behind the mountains. It was a great way to end our first day of our vacation in Switzerland with kids. 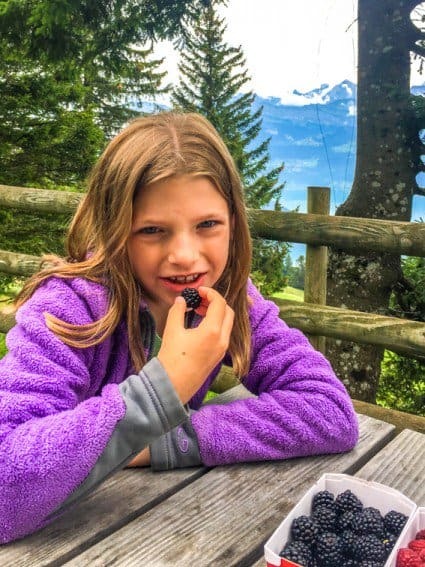 On our first full day in Switzerland with kids, we left Hotel International au Lac, and took a 90-minute train ride to Arth-Goldau, the location of one of the base stations for the Rigi cog railway. We chose to leave our luggage there in a locker during our day’s excursion to the Rigi Mountain. For a scenic Switzerland train ride, we took the Rigi cog railway (STP) up to the Rigi Klösterli stop, opting not to go up to the top as it was a cloudy day. Honestly, we should have stayed on the train a bit longer because the uphill hike from Rigi Klösterli to Rigi First was a steep climb with little scenic reward. However, the stretch of trail from Rigi First Kaltbad-First was nice, flat, and scenic. In Rigi Kaltbad-First we picked up some meat and cheese at a small grocery store for a picnic at the nearby playground. Then we checked the transportation schedules and chose to head down the mountain via the cable car to Weggis (STP) From Weggis, we took the ferry-boat to Brunnen (STP.) From Brunnen, we hopped on a train to Arth-Goldau (STP), picked up our luggage, took another train to Lucerne where we caught a connecting train to Engelberg (STP). Cog railway at Rigi has been climbing the mountains just outside of Lucerne now for almost a hundred and fifty years. Now there are several ways to get up this expansive mountain ridge overlooking Lake Lucerne. Railways, trails, and even cable cars criss-cross this alpine hiking paradise. Simply looking at a map the trains in Switzerland, it’s difficult to decide which way to go. (I admit that I should have probably asked around a bit about our itinerary before boldly setting off for the mountains.) But, all the trails are clearly marked on the maps readily available at the stations so it is difficult to really get lost. There are hotels and guesthouses up top of the mountain. However, most tourists make their visit as part of a day trip from one of the surrounding lakeside cities. There are also plenty of mountain huts serving food. However, we had difficulty figuring out which ones were actually open the day of our hike in Switzerland with kids. The tiny grocery at Rigi Kaltbad-First is a great place to pick up some food. There’s a mountaintop playground nearby so it’s a great place for a picnic. 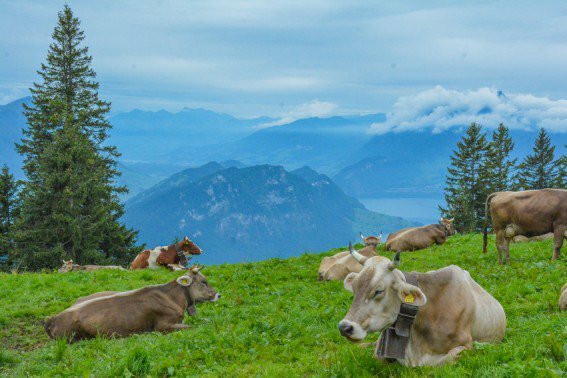 Rigi is the type of place that families can visit over and over again and always seem to discover something new on their Switzerland vacation. When visiting Lake Lucerne, don’t miss the view of the lake from the water. The beauty of the surrounding mountains provides a spectacular 360-degree panorama with peaks in every direction. Our entire family was disappointed that we didn’t have any time left to explore the city of Lucerne as we passed by on our way to Engelberg. My children had read about the iconic, wooden Kapellbrücke footbridge. They both just had to see it before setting out again for the mountains. I obliged by popping up out of the railway station just long enough to spot a glimpse of the bridge and its colorful flowers. Don’t make the same mistake as us when traveling in Switzerland with kids! Leave enough time to stroll across the Kapellbrücke bridge and enjoy the lake in Lucerne on your Switzerland vacation. Fortunately, we had the entire day to spend in Engelberg! (I found family-style accommodations much cheaper and easier to come by in this small ski village than in Lucerne an hour down the mountain.) So, after laying a load of hand-washed laundry out on our balcony to dry, we walked about a mile from our hotel, Hotel Belmont, to the cable car station for Brunni on the opposite side of town. 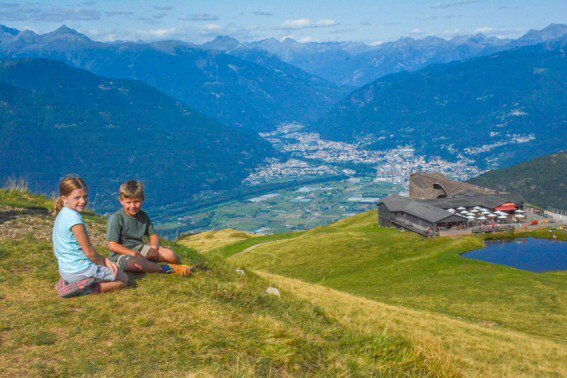 In the summer of 2017, kids were free on the Brunni cable car. Our Swiss Travel Pass gave adults a 50% discount. The most famous mountain railway excursion out of the small alpine town of Engelberg is the multiple stage ride up to the top of Mt Titlis to the snow-capped glacier. It involves a large revolving cable car and opportunities for playing in the snow through much of the year. Having experienced this attraction a decade earlier on a Switzerland vacation, I had envisioned taking my kids up to the top Mt Titilis on this visit to Switzerland. 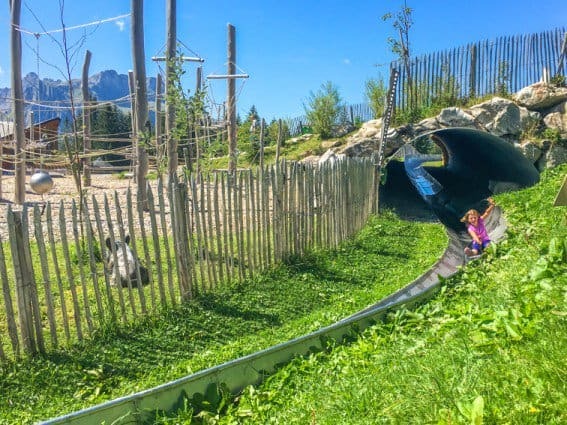 However, once I read about the adventures available for children at the Globi themed playground at Brunni, I decided that Brunni was a much better fit for visiting Switzerland with kids, and I was right. During our day at Brunni, the kids instantly became fans of the cartoon character, Globi, and we purchased all the English language books available. (There are dozens of books in German, but only 3 available in English at the time of our visit.) 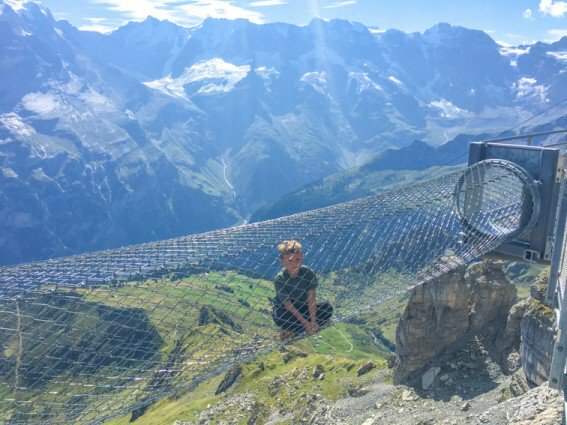 We found Globi theming on the massive playground at the Ristis cable car station, throughout a treasure hunt on the trail between Ristis and Brunnihütte, on the children’s menu at the restaurant at Ristis and even on a children’s ice cream that we purchased at a mountain hut. Globi is everywhere at Brunni! 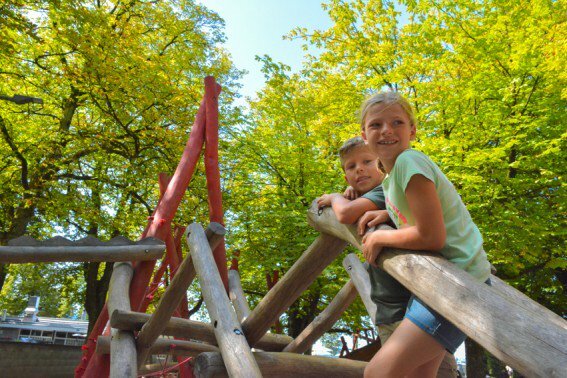 Of the eight mountaintop playground areas that we experienced in Europe in the summer of 2017, this one was by far the most fun for the kids. Between each adventure on the mountaintop, we kept coming back to the playground to play; the climbing structures, typical of Switzerland, are fantastic. Amidst the playground equipment is a summer toboggan run. (I’ve found it most economical for our family to purchase a five-run card for my children and me to share. They each get two chances to sled down the hill and then I take the remaining ride.) There was also a trampoline that my children simply loved. We purchased our laminated map for Globi’s Treasure Hunt at the Ristis station. While some of the instructions on the map were translated into English, the answers needed to be recorded in German. But, this didn’t stop us from enjoying our adventure! After families have completed the activity, they bring the laminated map back to the hut and receive a prize for their efforts. Our prize was a German-language Globi book. We completed the treasure hunt by hiking up the mountain (with 200-meter elevation change) from Ristis to Brunnihütte. Then we took the chairlift down the mountain as was recommended to us. I recommend that other lazy American families might want to consider taking the chairlift up the mountain instead. 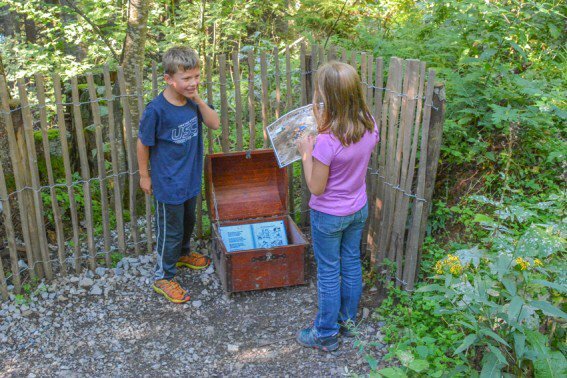 Then complete the Globi’s Treasure Hunt while hiking down the mountain. We wish that we had. Up at the top of the chairlift at Brunnihütte, there is a uniquely Swiss outdoor experience for hikers: the “tickle path”. Hikers walk around the lake barefoot across rocks, wood chips, and even different textures of mud — if you’re brave enough. According to the Brunni brochure, “Walking barefeet is not only a tingling experience but also a boost for body, mind, and soul.” While walking through the icy mountain water and different textures of gravel certainly was a “tingling experience” — I’m not really sure that it gave me a mental boost. 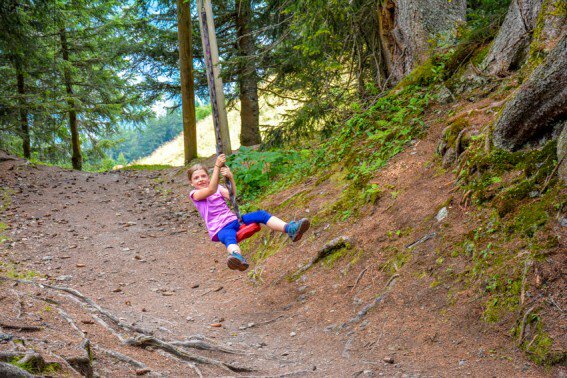 My biggest regret from our entire trip was not trying out one of the kid-friendly via ferrratas up at the Brunnihütte station. These mountain hiking challenges require hikers to rent climbing equipment and wear sturdy boots. My kids would have loved this. However, I was simply not brave enough to manage two kids alone up on the mountain while completing my first via ferrata. 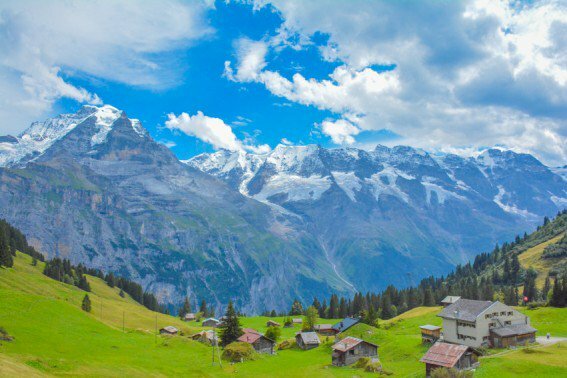 The Bernese Oberland is a true treat for families. Even traveling to the mountains is a fun experience. Both our train ride from Engelberg to Lucerne and Lucerne to Interlaken had a special scavenger hunt to entertain the kids. Most of the trains shuttling families from Lucerne to Engelberg and back have a designated Globi Express children’s car that has Globi books (in German) and a scavenger hunt where children look for various signs featuring Globi at every station and tunnel. 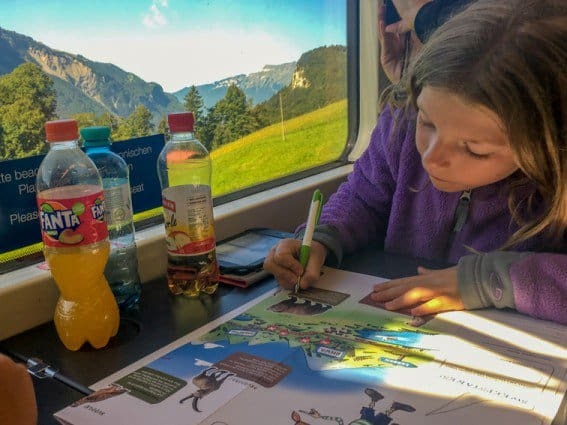 There is also a scavenger hunt along the Golden Pass Route from Lucerne to Interlaken over the Brünig Pass; children in our train car from all around the world were working together to spot the native Swiss animals strategically placed along the route and check them off on their maps. We didn’t know about the Golden Pass scavenger hunt prior to boarding. However, after seeing some other children working on the scavenger hunt, I asked a train conductor about it and he was able to get us a couple of maps. Lesson learned: Always ask about special children’s programs on a Switzerland vacation! In the shadow of the Eiger, Monch, and Jungfrau, the views from Männlichen are some of the most picturesque of the Alps. Not surprisingly, there’s also plenty of alpine fun for the kids. There are themed trails and mountaintop playgrounds. Männlichen is accessible via both the Grindlewald and Lauterbrunnen valley. It sits right in between them affording sweeping views of both. Lieselotte, a familiar German children’s book character, welcomes the youngest visitors. 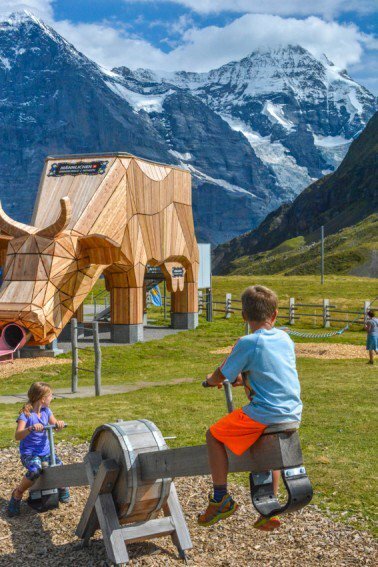 On the mountaintop, children are delighted by a cow-themed playground. There is a Lieselotte-themed walking trail back down the mountain towards Grindlewald. 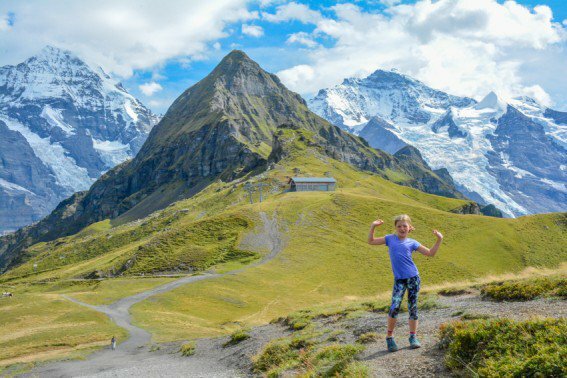 The Panorama Trail from Männlichen to Kleine Scheidegg is one of the most popular in the region; the 1.5-hour trail with a gentle downhill grade is perfect for families and even possible with a rugged jogging stroller. As the trail winds along the mountainside towards the Jungfrau, views of the mountains continue to change; we couldn’t stop taking pictures of the beautiful landscape. It is a must see on any Switzerland itinerary. Of course, there are also plenty of cows to see along the way so there is an ever-present jingle of cowbells. 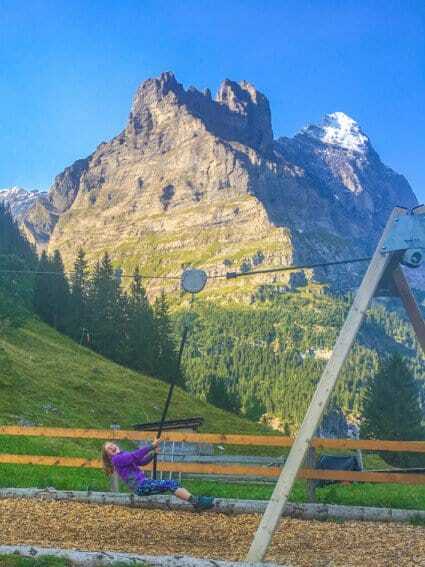 As the trail approaches Kleine Scheidegg, there are restaurants with playgrounds serving typical mountain food; while the first one has the better view, the second one has a trampoline. On our second day in Lauterbrunnen, we started out early taking the bus further into the valley to Stechelberg (STP.) From Stechelberg, we boarded a packed cable car with lots of tourists up to Gimmelwald. Then we continued on to Mürren (STP) towards the popular Schilthorn mountain peak. From Mürren, we continued up again via Birg to the top of the Schilthorn and Plz Gloria at 9744ft (%STP.) At the top of the Schilthorn we spent 30-45 minutes enjoying the views and the modern, interactive James Bond Museum before heading down to Birg to do the cliff walk there. 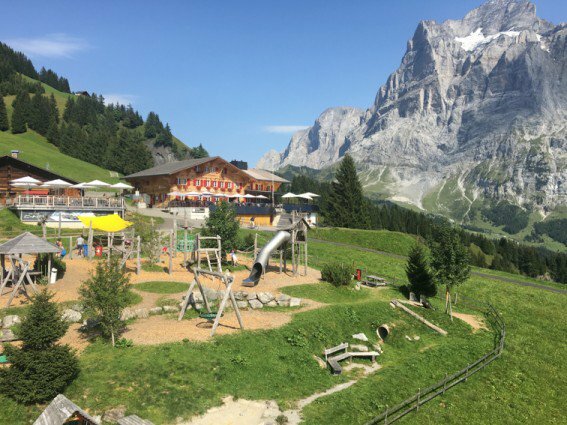 Finally, arriving back in Mürren, we took the funicular up to Allmendhubel (STP) where there is a beautiful playground and mountain hut serving lunch. 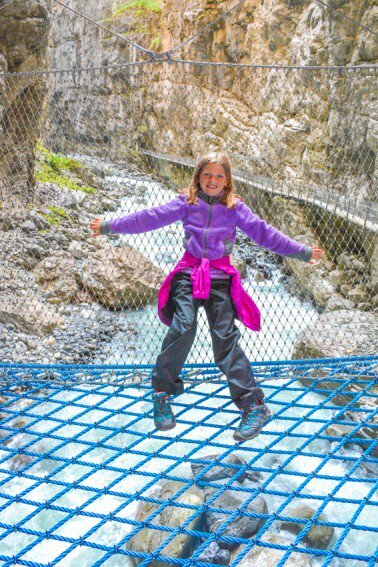 From Allmendhubel, we took the Children’s Adventure Trail back down the mountain to Mürren where we took the cable car back down to Stechelberg (STP.) 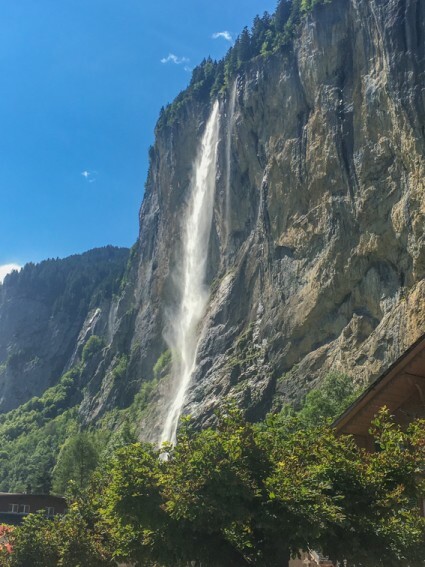 On our bus ride through the valley back to Lauterbrunnen (STP), we stopped at Trummelbach Falls. At 9,744 feet above sea level towering over the Lauterbrunnen Valley, the 360-degree views from the top of the Schilthorn are unmatched. It’s no mystery why this stunning location was chosen for a thrilling scene in an early James Bond film. 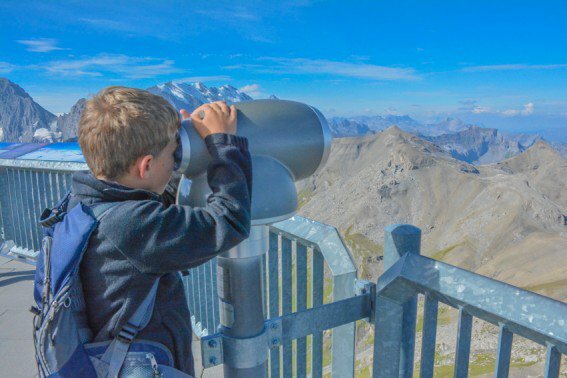 With interactive displays for kids across the mountaintop and a modern kid-friendly Bond World museum, there’s more to do at the top of the Schilthorn than simply marvel at the view and take selfies. At the free, indoor Bond World museum, families can even get an aerial view of the mountain as they fly a helicopter over the peaks James Bond style. My seven-year-old repeated the adventure over and over again until another family showed up for their turn. Just about 1000 feet gondola ride down the mountain at the Birg station, the Thrill Walk offers several unique cliffside perspectives. There is a crawl through wire tunnel suspended above the rocky cliff and a glass bottom path skirting the mountainside. It’s just right for families that want a bit of adventure, but find the reality of climbing high mountain peaks too dangerous. 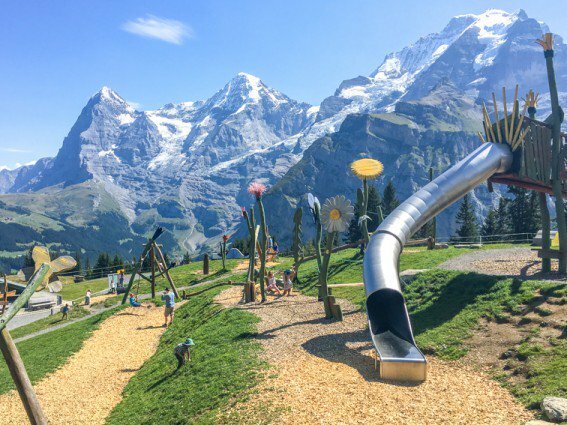 After a morning up at the Schilthorn, the Allmendhubel Flower Park playground is the perfect place to let the kids play. 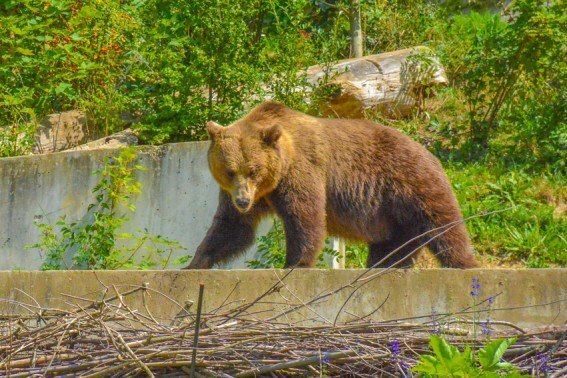 The wooden flowers, slides, zip line, and marmot-themed tunnels are all within sight of the patio of a restaurant serving up traditional mountain fare like melted raclette cheese and potatoes. This playground and restaurant are no secret. The tables at the restaurant were nearly full on an August afternoon. We met more English-speaking families at this alpine playground than any other we visited on our Switzerland vacation. I admit that it was difficult to pull my children away from this fanciful, colorful play area. However, the promise of a hike along the Children’s Adventure Trail helped. 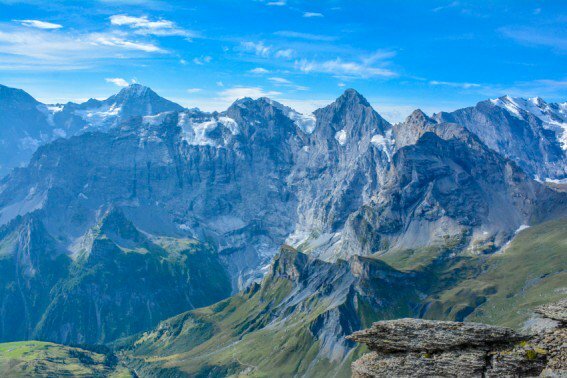 As we hiked back down to Mürren along the marked Children’s Adventure Trail, the views did not diminish. It was a bit tricky to find the “adventure” part of the trail. (The maps in Mom:Tots:Zurich’s blog article are quite helpful.) There is a full playground hidden in the forest off to the left-hand side of the trail as it winds down the mountain. It is a bit curious to spot a slide and then a zip line partially hidden in the forest. However, the kids were keen to explore and found plenty more adventures in the woods. 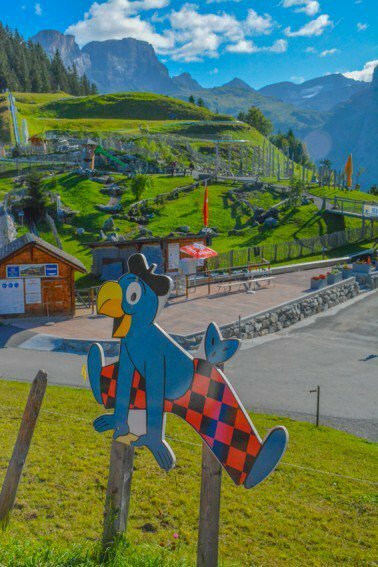 The adventure continues with another small play area with a whimsical rainbow-colored slide just outside of Mürren. Trümmelbach Falls is an easy stop along the bus route between Lauterbrunnen and Stechelberg. 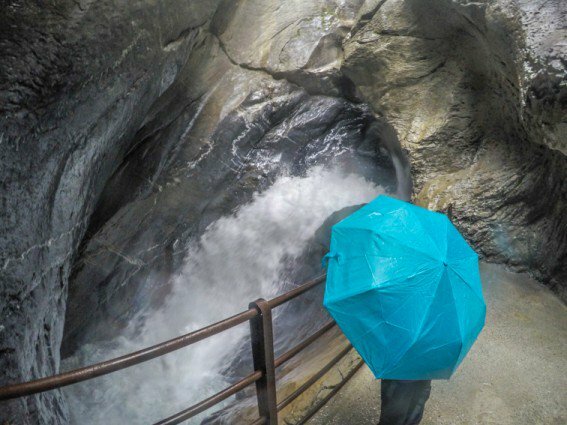 If you’re faced with a rainy or cloudy afternoon in Lauterbrunnen, Trümmelbach Falls is the place to go. It’s not indoors and you will be exposed to the elements. However, the experience of the falls will not be diminished in any way by overcast skies and raindrops. Trümmelbach Falls is composed of several viewpoints of a waterfall that has cut through a rock formation in the cliffside; the sheer force of the water is impressive. It’s one of those places that is simply impossible to capture in a photograph. Our final day in Lauterbrunnen, we took the train over to the neighboring valley of Grindelwald (STP.) Arriving early in a busy Grindelwald train station, we quickly took the bus out to the Pfingstegg cable car base station and took the cable car up the mountain (% STP.) At the top of the mountain, we enjoyed a children’s playground with a bouncy castle and zip line; we also took a few runs on the mountain toboggan run before setting off on a hike down the mountain towards a mountain hut for lunch. After lunch, we went to the Glacier Gorge (Gletscherschlucht), where we caught the bus back to Grindelwald (Swiss Travel Pass.) 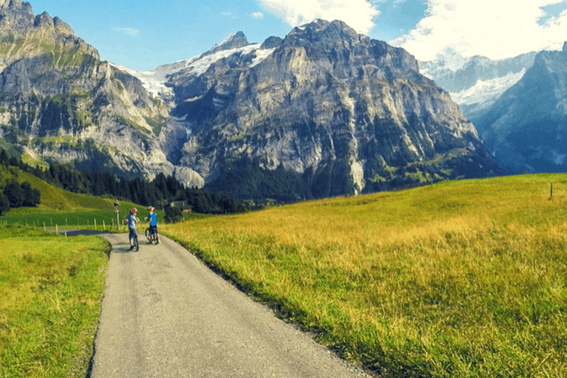 Back in Grindelwald, we took the cable car up to Grindelwald-Bort (% STP) to enjoy the views at the playground and then ride Trotti bikes back down the mountain. The cable car to Pfingstegg is tucked away in a corner of the valley just outside of Grindelwald. The cable car takes visitors up to an area with a small playground with a zip line, restaurant, and summer toboggan run. The area overlooks the Grindelwald Valley It is the trailhead for a couple of day hikes out towards the Lower Grindelwald Glacier. Most of these hikes are suitable for families with older children and teens. Instead of heading up towards the glaciers and mountaintops, we hiked down towards the Restaurant Marmorbruch. At the restaurant, we enjoyed a memorable lunch topped off with meringues and cream. Just a bit further down the trail, we reached the Glacier Gorge. 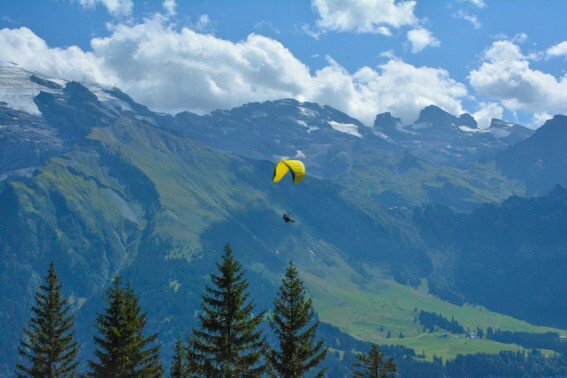 The Glacier Gorge is accessible from Grindelwald via bus or by hiking down from Pfingstegg. In a place where experiences and views cost so little to enjoy, I felt the entrance fee to the Glacier Gorge was a bit steep. However, it is a fun outing — especially for adventurous kids who like a thrill. The highlight at Glacier Gorge is a large net that stretches across the gorge and the rushing glacial river beneath. Families can climb across the net, even bounce up and down a bit; the water of the river roars beneath. It takes an hour or so to hike to the end of the trail and back. It is quite a remarkable trail running along the cliffside hugging the gorge. On a hot day in the mountains, the cool air of the gorge is refreshing, if not downright chilly. Located centrally in the town of Grindelwald, a popular series of cable cars take visitors up to the alpine heights to Bort and then on to Schreckfeld and First. Families could certainly spend a full day exploring this area, but seeing as we only had a couple of hours, we only went as far as Bort. 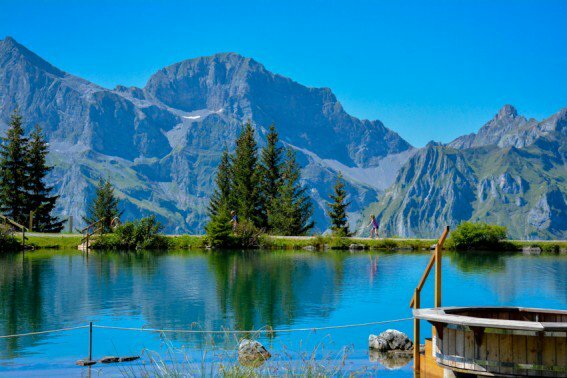 At the top in First, there is a cliff walk and a zip line for the adventurous as well a tot-friendly hiking trail to Bachalpsee for those looking for a calmer way to enjoy the alpine scenery. Between First and Bort at the Schreckfeld station, families with children over 135 cm (about 10-12 years old) can rent mountain carts to ride downhill to Bort. At Bort, there is a marmot-themed alpine playground. 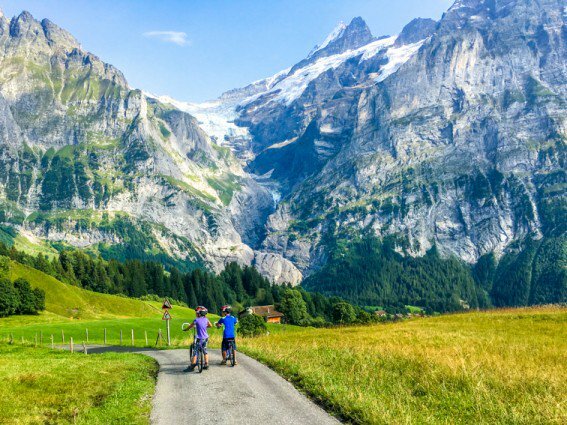 My kids only played a short time because they were so very excited to ride Trotti scooters downhill to Grindelwald. Riding a Trotti scooter downhill is quite a thrill! Children are required to be at least 125 cm (about 50 inches); at ages 7 and 8, my children barely made the cut. My son was ready to fly down the road the second he got his scooter. However, my daughter took a little time figuring out the brakes. Ultimately, they both beat me down to the town of Grindelwald. I was so distracted by the awesome views. On our seventh day in Switzerland with kids, we packed up and left the mountains for the city of Bern. Having traveled to Switzerland twice previously, Bern has always been one of my favorite Swiss cities. 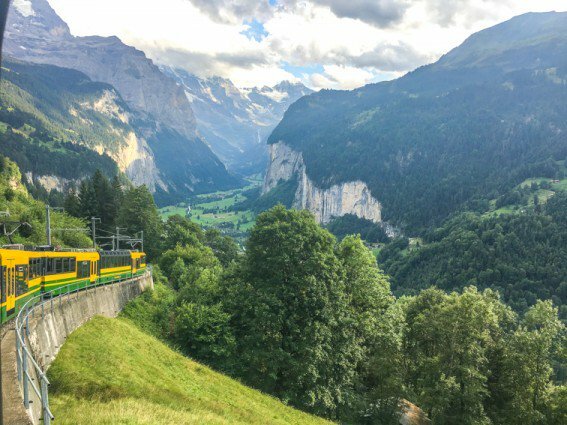 We took the train from Lauterbrunnen to Bern via Interlaken (Swiss Travel Pass); once in Bern, we used the city tram (Swiss Travel Pass) to get to our hotel, Hotel Alpenblick. Upon arriving at our hotel and settling into our marvelous family room just steps from a fun library and sitting room area, we set off on foot to explore the city. 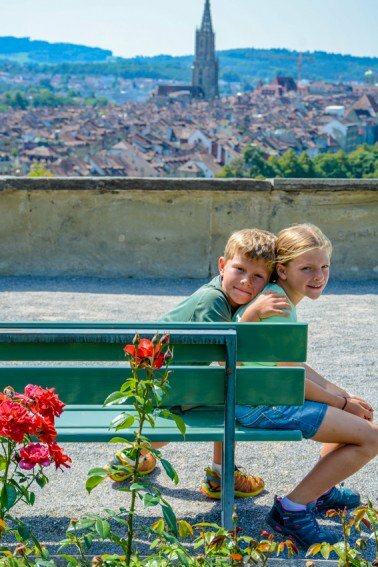 Bern is a lovely city for families to explore. It is also a convenient city stopover after a visit to the mountains in Switzerland with kids. While I haven’t had the opportunity to visit, I’ve heard that Bern’s museums, especially the Einstein Museum and Paul Klee Center, are fun for children and teens. I’m always so charmed by the city itself, the historic city center, the brilliantly blue Aare River ,and the cute rose garden overlooking the city, that I feel no need to go indoors. On this visit to Bern, my family enjoyed a leisurely lunch at the restaurant adjacent to the rose garden. We followed up lunch with playtime at the super fun, shaded playground just steps away. The famous rose garden was only a 10 -15 minute walk from our hotel. Our hotel was in one of Bern’s neighborhoods bustling with local children playing on the sidewalks. Playtime at Bern’s playgrounds, a stroll along the Aare River, and a visit to Bern’s bears are the highlights of a laid-back family afternoon in Switzerland’s capital city. We capped off our city adventure with a gelato and a walk through the city’s historic center. Then we found a restaurant and another playground back in the neighborhood near our hotel. In the final leg of our journey through Switzerland by train, we traveled from Bern to Geneva via Lausanne (Swiss Travel Pass.) We rode public transportation in all three Swiss cities we visited. The pass even gave us free entry to the Olympic Museum in Lausanne. In Geneva, we stayed at the Holiday Inn Express out by the airport for easy access the following morning. During our month in Europe, we had visited cities from Krakow to Venice to Munich. Thus, I was not particularly inspired to spend much time in the cities of Switzerland. 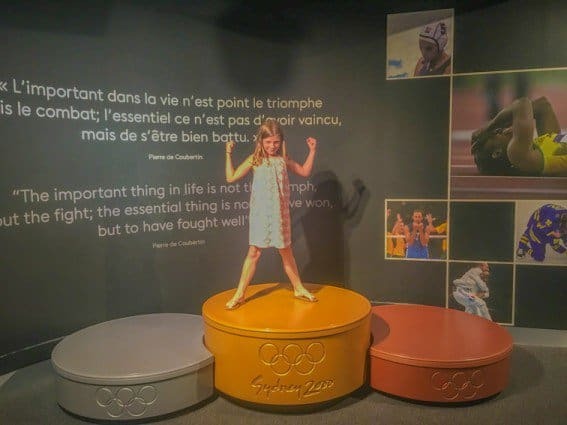 It turned out that a quick afternoon visit to the Olympic Museum in Lausanne was a surprise highlight for us on our Switzerland vacation itinerary. Looking to visit more cities on your Switzerland vacation itinerary? Check out Trekaroo’s Top 10 Things to Do in Zurich with Kids. The Olympic Museum has a variety of exhibits on multiple floors. 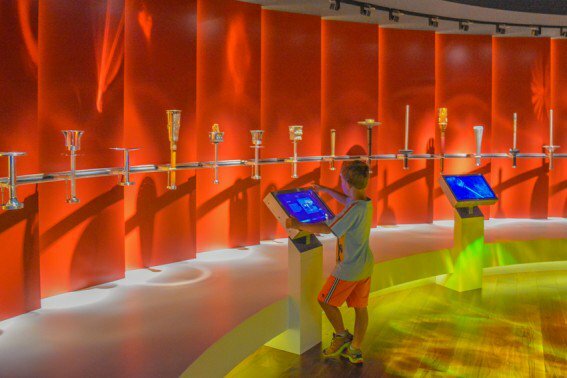 Highlights of the museum include the torches used at all the Olympic Games. There is also a moving video featuring moments from various Olympic Opening Ceremonies. I’ve always loved the Olympics. It was really special to be able to introduce my children to past Olympic memories. A highlight for the entire family are uniforms from various sports worn by legends of the Games; of course, my daughter couldn’t get enough of the figure skating dresses. There is also a small interactive area where visitors can test their reaction time and other athletic skills. Want to learn a new language before heading to Europe? Check out this review to using Rosetta Stone as a family. All photos by the author, Melissa Moore. This is really a good write-up. I have enjoyed the eading throughout. I am visiting Switzerland (Geneva) with my family in 1st week of July for 6 days. We are thinking about starting from Lauterbrunnen. Can you provide step by step things to do like from the hotel, how to go to the train station, which train to catch etc.? Thanks! Typically, I ask for information about trains at my hotel; staff at hotels are most often both knowledgeable and helpful with train specifics. Hotel suggestion are included throughout the article; look for links. Hi, thanks for sharing your itinerary! I read through a couple times and don’t think I saw what time of year you visited – what month was it? It looks like the weather was pretty great for your trip? I am thinking of going with my husband, 2 year old, and 4 year old some time between April – July. I’d love for it to be warm, but I’m also trying to minimize the probability of being rained in for entire days in a row. Thanks! We traveled in late August on this trip – and our weather was amazing. Earlier in the summer you’ll see more snow on the mountaintops. I’ve traveled to Switzerland in mid-June before, and it was beautiful. I’m taking my kids interrailing across Europe this summer. Thank you for sharing your itinerary. It’s really helpful. I love the look of the bob sled on Mount Tamaro. I’d be travelling on my own with my 5 and 8 year old, so it may be difficult for me to do with them, as I assume that my 8 year old wouldn’t be allowed to sled on her own. Glad it’s helpful. Age 8 is often the cut-off for being able to go alone; sometimes kids have to be a certain height – around 52-54 inches. So, if you have a tall, responsible 8 year old – you’re probably good to go. When we traveled a couple of years ago, I believe that my 8 year old was allowed to go alone and that my 7 year old was allowed to go with my 8 year old at this particular location. I always tell my kids that we’ll see how it goes when we get there. Have fun in Switzerland! Your kids are really the perfect ages for this sort of trip. Thank you very much for putting this together, I am planning a trip to Switzerland this summer with 3 very young kids and this looks like a perfect itinerary to start my planning. My wife and I really try to include some playgrounds into our adventures with the little ones and these look fantastic, especially the playgrounds with alpine views. This post is a gold mine of information, thank you again. Enjoy your visit to Switzerland. It is a great place to travel to with kids. There are lots of playgrounds with amazing views. Your kids will love it.